at he or she will develop a drinking or drug problem. Eventually, the overuse of these substances can develop into Substance Use Disorder (SUD), and treatment should be given for both PTSD and SUD to lead to successful recovery. The good news is that treatment of co-occurring (happening at the same time) PTSD and SUD works. Studies show that there is a strong relationship between PTS/PTSD and SUD, in both civilian and military populations, as well as for both men and women. Almost 1 out of every 3 Veterans seeking treatment for SUD also has experienced PTS. How can co-occurring PTSD and SUD create problems? If someone has both PTSD and SUD, it is likely that he or she also has other health problems (such as physical pain), relationship problems (with family and/or friends), or problems in functioning (like keeping a job or staying in school). 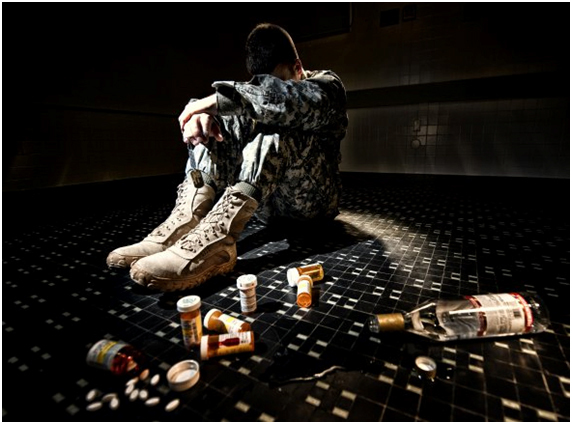 Using drugs and/or alcohol can make PTSD symptoms worse. PTSD may create sleep problems (trouble falling asleep or waking up during the night). You might “medicate” yourself with alcohol or drugs because you think it helps your sleep, but drugs and alcohol change the quality of your sleep and make you feel less refreshed. PTSD makes you feel “numb,” like being cut off from others, angry and irritable, or depressed. PTSD also makes you feel like you are always “on guard.” All of these feelings can get worse when you use drugs and alcohol. Drug and alcohol use allows you to continue the cycle of “avoidance” found in PTSD. Avoiding bad memories and dreams or people and places can actually make PTSD last longer. You cannot make as much progress in treatment if you avoid your problems. You may drink or use drugs because it distracts you from your problems for a short time, but drugs and alcohol make it harder to concentrate, be productive, and enjoy all parts of your life. All inquiries and follow-up support will always remain confidential.